Are you into Mexican food? Quesadilla is a great Mexican dish which is easy to prepare especially when you are using the right Quesadilla Maker . The Hamilton Beach Quesadilla Maker facilitates not only easy preparation but quick preparation – you can enjoy a delicious restaurant quality quesadilla in just 5 minutes. From the name, it is clear that this product is a quesadilla maker. It is manufactured by Hamilton Beach, which is a top kitchen appliances distributor. The company prides itself on providing high quality and has over the years build a brand strong enough that most American households trust it. This quesadilla maker is convenient for small households as it only makes six wedges of quesadillas. 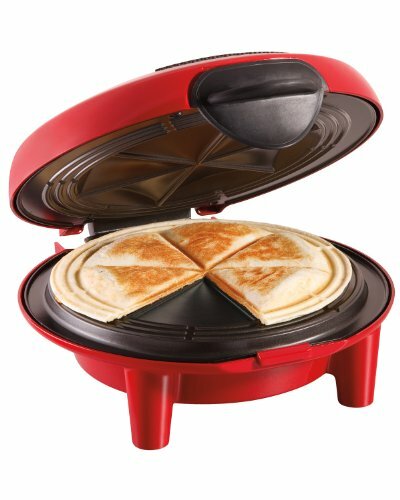 So what is unique about the Hamilton Beach 25409 Quesadilla Maker? Once you have two 7”-8” tortillas and the desired fillings ingredients ready, you can prepare six wedges of quesadillas in 5 minutes. This feature saves time so that you will not keep your family hungry for long in case you are late. If you have ever prepared quesadillas before, then you know the largest challenge is avoiding creating a mess. Often, the filling ingredients, especially cheese, overflow. Fortunately, this quesadilla maker comes with a locking lid. The cover prevents overflow of the ingredients and allows you to store the maker upright. Once you plug the device, the red light indicates it is on. After 2-3 minutes, the preheat light (green) glows. The signal shows just the right time to open the lid and put the tortillas and the ingredients. Without it, you would just have to employ trial and error to determine if the device is hot enough. Cleaning is an important aspect of kitchen appliances, especially the electric appliances. The nonstick surface of the Hamilton Beach 25409 Quesadilla Maker makes it easy to clean. To avoid difficulties in cleaning, wipe the surface immediately after preparing the quesadillas. What is your quesadilla recipe? It is probably the one you inherited from your mother. 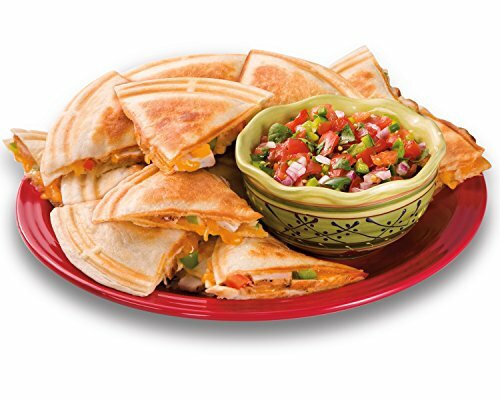 Hamilton Beach provides several quesadilla recipes that are printed on the devices manual. Hamilton Beach 25409 Quesadilla Maker is worth the money. The cook time, nonstick surface, locking lid, and preheat signal are high selling points. Also, the product comes from a reputable manufacturer, and it is a bestseller in its category. Order the Hamilton Beach 25409 Quesadilla Maker now .